Arizona Prison Watch: Corizon HealthScare: Another death row suicide. 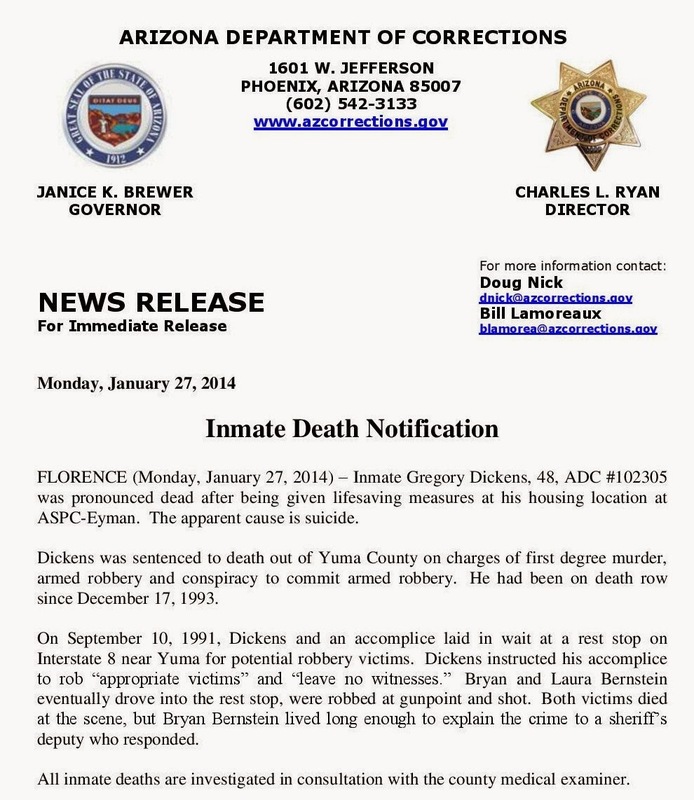 Most Arizonans probably think "good riddance" whenever a death row prisoner commits suicide. I've seen such remarks on comments following articles posting about young drug offenders hanging themselves in jail or prison, too, however, suggesting a particular public callousness towards all prisoners of the state, as well as their survivors. What I've seen in the wake of these suicides, though, has been the grief of the survivors, who dont deserve the community's abuse or ridicule when searching news articles for answers, and I know that in cases where a killer dies, it brings up all sorts of feelings for the survivors of victims as well. Condolences to all of you whose grief is triggered by this news. That said, this is to announce that another condemned prisoner has beaten the state to the punch and taken his own life: that's three from death row in less than nine months. Gregory Dickens, 48, was preceeded by Dale Hausner in June and Milo Stanley in May of 2013. The deaths of these condemned men is part of a streak of suicides and suspicious, premature deaths that have happened since Corizon took over the contract to provide medical and psychiatric services for AZ DOC prisoners in March 2013. To make a sweet profit at less than the state would have provided such services for, they're cutting corners wherever they can - apparently mostly for prisoners they think the public doesn't care about anyway, like these guys held in AZ DOC's supermax prison complex, ASPC-Eyman, which includes death row. Say what you will about the evils some of them may have perpetrated, but we are condoning torture through gross medical neglect. Like medical care, psychiatric "treatment" under corizon has been streamlined to maximize efficiency and company profit. This May 2013 letter from advocate Donna Hamm to DOC Director Charles Ryan illustrates the kind of "care" prisoners at the Supermax are getting from Corizon. Keep in mind that many of these men were imprisoned in the first place or sent off to Supermax because of poorly treated psychiatric conditions - and that most male suicides are occurring in these maximum custody and solitary confinement cells. Ms. Hamm was soon put on notice about other troubling practices and policies put in place by Corizon for evaluating and treating serious mental illness, as indicated in this October email to the DOC director. Mr. Ryan's responses to her letter are embedded in the email in bold letters. "He did try to get mental health when during his time in the minimum unit but he was never called in. When he was in medium security unit he was finally called in for evaluation, he was woken up at 2am, handcuffed, and taken to Central unit. At that time, as no-one was telling him what was going on, and he thought, he was gong to get moved there and he could get executed. The visit was a "telemedical" visit and he had to speak with someone over the TV. Obviously, he did not like the fact he had to speak in front of other inmates about his issues. The frequency of his anxiety attacks increased significantly immediately after and he declined further care...."
Given that at least ten prisoners now (perhaps more, as many young recent deaths have been noted by DOC as due to "unknown causes") have killed themselves in less than a year with Corizon HealthScare, it seems as if its' time for the DOC to seriously re-evaluate that contract. AZ legislators who ordered DOC to privatize the health care for prisoners should be less worried about assuring corporate profits to Corizon and more concerned with public health consequqneces of mass incarceration and poor prison health care. Keep in mind that 95% of these prisoners will someday return to the community - over 40% of whom are infected with Hepatitis C now, due to rampant heroin addiction in the prisons and an obscene lack of substance abuse treatment services (only 4% of state prisoners are able to access help for their addictions in a given year). Prisoner health IS public health. On or about October 3, 2013, about 20 men at the Meadows Unit (medium custody) were placed into shackles, chains and cuffs and transported to the Browning Unit (maximum custody) where they were placed in a holding cell, awaiting a video-conference with a psychologist. Apparently, this is the imminently "professional" manner in which Corizon, with the cooperation of DOC security staff, is conducting psychological evaluations for dispensing mental health medications. During the entire time the men were inside the locked holding cell awaiting their turn for the videoconference, the shackles, chains and cuffs were not removed. This exercise took approximately five (5) hours. I do not have information about whether the men were fed during the five (5) hours, but I suspect they were not. If they were, how does one eat or drink when one's hands are attached to a belly chain? It should not be surprising to you that these men were extremely upset with this procedure. The failure to remove the shackles, chains and cuffs for medium custody inmates who were locked in a cell in a maximum custody cellblock is no doubt based upon pure institutional convenience -- another way of putting it would be to say that the guards were too lazy to go through the "effort" to remove security devices that would later be reapplied. The security implements were not removed from the prisoners until they returned to the Meadows Unit. Several of the affected inmates have stated to me that they do not wish to continue on their psych meds if they are forced to go through this psychologically stressful and tortuous exercise in the future in order to be given an impersonal "interview" of very brief duration with someone who is dispensing medications via videoconferencing. In addition to the reprehensible decision to leave these men in shackles, cuffs and chains, it is particularly important to take note of the fact that these men were transported for the purpose of having their psychotropic medications evaluated, approved or modified/renewed. Because of the externally-caused psychological stress, it seems quite problematic for any psychiatric professional to be able to make an accurate determination of the patient's affect, response to current course of psychotropic treatment, and potential need for modification of medication or dosage when the patient is presenting under such externally negative conditions. It is noteworthy that if these men were so stressed by the procedure that was devised and utilized by the ADOC that they subsequently elect to withdraw from psychiatric treatment rather than be subjected to such an unprofessional and distressing course of action, then the entire "scheme" of psychiatric treatment for these men must be called into serious question. The Department of Corrections cannot utilize a method that, in fact, directly interferes with the very diagnostic procedure that they are claiming to provide. This is akin to giving 20 inmates a ride on a super high roller-coaster and then lining them up to test to see if they need blood pressure medication. 1. Why are medium custody inmates transported to a maximum custody facility in the first place? This would appear to be a violation of your own Classification Policy which prohibits mixing custody levels. Browning Unit is the designated facility for tele-med in the Eyman Complex. Custody levels are not mixed during the process. However, it would be allowed by policy to occur since it is lower custody to higher. 2. You only have two maximum custody facilities, but you have a host of lesser custody units at Florence. Why not have videoconferencing facilities at each classification level so that custody levels do not have to be mixed? IF YOU AND CORIZON ARE SAVING SO MUCH MONEY BY VIDEOCONFERENCING RATHER THAN BY PROVIDING PERSONAL CONTACT WITH A PSYCHOLOGIST, PSYCHIATRIST OR DOCTOR, THEN WHY ISN'T SOME OF THAT SAVINGS APPLIED TO INSTALLATION OF VIDEO CONFERENCING IN EACH UNIT? Or at least at each administrative building in each unit? The practice of tele-med has been in place in ADC for a number of years, long before privatization of health services. It is the practice to place the equipment in the highest custody unit at the complex as policy does not allow to transport to a lower custody unit. It does not preclude transport to a higher custody unit. Your suggestion will be given due consideration. 3.Prior to chaining and transporting these men for five (5) hours and holding them in a locked cell for so long, were their medications (for other conditions) checked? Were diabetics or men with other conditions negatively affected by such conditions imposed for five (5) hours? The total time of transport reported was 3 hours, not 5. Upon learning that the inmates were left in restraints during this time, the Deputy Warden issued a directive, prospectively, that the restraints will be removed once the inmate is secured in the holding area. All the inmates received their medications prior to the transport and those that had KOP’s were allowed to take theirs as well. The inmates were fed prior to the transport and did not miss any meals. 4. If it is an inconvenience to apply and remove shackles, cuffs and chains for individual inmates, then why not eliminate all need for shackles, cuffs and chains by installing one more videoconferencing site in the unit -- or at least at a commensurate custody level unit -- where inmates will be cared for via video-conferencing? Responded to this issue above in #2. 5. Were each of the 20 men given a private consultation with the doctor, or were they given group consultations while chained, without privacy? All inmates that participated in this tele-med visit were provided with a private consultation with the provider. Please respond in a timely manner. I would like to insure that this procedure is not taking place at any unit in any prison for Arizona's prisoners. This has been addressed appropriately throughout ADC.